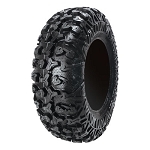 The EFX Moto MTC ATV tires have a non-directional tread pattern very similar to the Maxxis Bighorn but more aggressive. The tread design offers excellent traction going both forward and in reverse. The very aggressive 1 1/4 inch lugs give your quad a powerful look and feel. Despite having such an aggressive tread design the Moto MTC tires actually drive quite nicely on asphalt and other hard packed terrain. 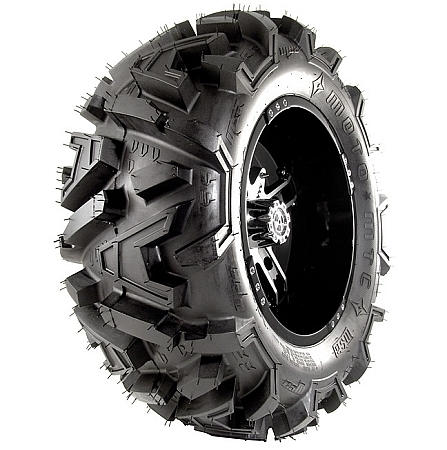 This is a true & proven mud tire that can also serve as an all-terrain tire. 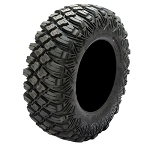 - EFX ATV tires are sold individually. 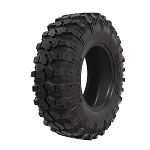 - Moto MTC Tires are an excellent aggressive all-terrain tire. 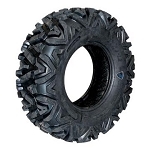 - 6-ply ATV tire providing outstanding puncture resistance. - Very knarly tread pattern that differs from all other tires available. - 1 1/4 tread depth. These tires are absolutley amazing. Different people have different likes and dislikes pertaining to their riding style, but if you want a smooth ride, looks, durability, and great traction, then these are the tires for you. I bought these tires in 26x9x14 (front) and 26x11x14 (rear) with a set of MSA diesel rims. I have to say that these tires are purely indestructable from what I have put them through. The only downfall I have is that I have a straight axel on my Foreman and it bogs down way to easy. The traction I get from these tires are outstanding. I have never seen a better all around tire for some of the things that I do. I have a few videos of these tires in action on YouTube @ 07kodygsr. Check it out. these tires are the s###. i have not found anything these beasts want go thru or up!!!! I own an Arctic Cat Wildcat Trail. Ordered 28x10x15 all the way around. Tires have proven to be excellent in rocks, mud, snow and have very good grip when climbing. Very happy! I am running 30x10-16 on my 2013 rzr 800 s. Great traction in mud, rocks and gravel. Tires clean out very well. Super stiff side walls. I had to use tire balance beads shook very bad around 30 mph the beads cured the balance issue. Deep lugs give it a great look. Very happy with them overall. Pureoffroad is great to deal with. These tires look really great on the Rancher 420. Rancher has plenty of power even with the 2" tire upgrade. They ride very well even on hard pack. Steering is very comfortable. They handle loose dirt and the average mud hole with ease. Heavy very loose sloppy mud is another story, but is a good trade off for looks and comfort and is much better than stock. Tires lay flat on surface with 5 lbs of air in them and handle weight very well. I would not think I could find a better tire. I just wise they would make them for 12" rims so we would have more sidewall. These tires are awesome and ride very good to im very impressed i would recommend to anyone. I will do business again !!! Thanks !!!! The product was great, and the service was quick and accurate. Great tires thus far cant wait to see how they are in the long run. I bought the 30" for my 850. They ride very smooth, have some wobble at about 20mph on the road. But im trying to see if thats cause from the bike or the tire. They clean pretty well while in the mud and clean out fast after the mud whole. Overall good tire for light to medium mud riding, while keeping it simple to ride around the farm. These tires look great and look more aggressive in person that in the pic. No regrets on this buy. Great tires really impressed with them. Recommend on buying these. Great company to order from simple and great shipping speed. I bought this tire and a m20 rim for my spare and they mounted them together for me great customer service. These tires are great. Over 300 miles in the Paiute trails last year and not one problem. Over 500 miles on them now and plenty of tread left. Have recommmended them to my friends. Also have a set of there sand tires which are exceptional. Look great on new MSA M20 14s. Ride well and great all round tire. My second ride with these tires and I got a hole in the side wall from a rock. running 6 psi in them so I put 10 psi in them now so the tire doesn't pinch against rim. Good thing they dig great in the mud. Great tough tires at the best prices I could find. I lost a little of my ride and the tire are noisier that stock tires but all was expected and worth it. Put these on my 2013 polaris ranger crew 500. So far I like them, True test will be next month at jamboree. Been in mud/gravel/streetso far and they did great. These Tires are the best I have ever seen.good Quality good price. will do Business gain THANKS ALOT!!!!!!!!! I purchased these tires and wheels as a set. Not only was the price great but the product was quickly shipped and arrived just as adverstised. Great service and great product. well they really grip the trail . they are like having shovels on in deep sand and gravel though . second ride we got stuck in peep mud and gravel hole up too our muffler while spinning bike sucked rocks into both back rims .the rocks punched holes in the stock wheels 2012 850 xp blue fire with about 25hrs on it so i just ordered two crusher rims think they will look killer they are 1.5" wider stance than the stockers should look boss . they are an extremely gripping tire. we like! Excellent tires at a great price. A: If you have an LE model you most likely have 14" rims but you will want to double check that. Look at the tires on your Ranger. There will be 3 numbers. The last number is the size of rim you have. For Example if your tire says 26/9-14 that means you have 14" rims. Let us know. Q: Will the 26x9x14 (front) and 26x11x14 (rear) fit my on my 2011 Polaris Sportsman 850 XP EPS Limited Orange Madness without having to add spacers or risers so they don't hit the fender wells, suspension, etc. And, will they fit on the stock 14" Polaris rims? A: Yes they will fit your machine and your factory rims just fine. Q: I am looking for a tire for the ranger we use on the deer lease. Rocks and thorns.... would like an 8 or 10 ply. Will you please recommend one? A: I would recommend one of our 12 ply run flat tires. The Sun F A-033 or the DWT Moapa. Both would be an excellent option for what you need. Q: what is actual price on 30x10x14 MOTO MTC? W/shipping etc?